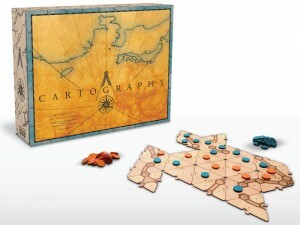 Cartography is a new map-making, territory claiming, strategy game based on the game of go. Developed by Jon Adams, the game’s map is made up of interlocking triangular tiles, with walls that divide the map, allowing territory to be defended or captured. Players create and claim territory, and capture opponents, in an effort to control the map, which, like go, changes as you play. “Strategy is key and chance doesn’t determine the winner,” says Adams. Like go, “Cartography is easy to learn and challenging to master!” Adams has already raised over $14,000 of his $15,000 Kickstarter campaign to launch the game. Thanks to Jeff Diamond for passing this along.